Valentine’s Day is such a fun time to celebrate love and friendship with yummy, beautiful treats! 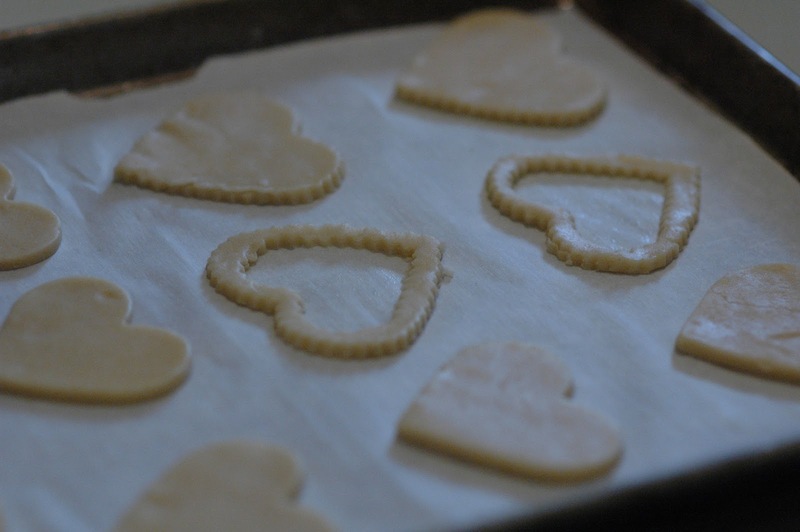 I know some people resent Valentine’s or are turned off by the tacky glitz of it, but I seem to think it is a time to make homemade cards letting people know you love them and to bake fun goodies…just because! And buy conversation hearts, whether you like to eat them or not. So this Valentine’s season have some fun! Whip up something sweet, pretty, and tasty. Iced Sugar Cookies. Both lovely and full of butter. Both seem too pretty to eat…until you taste that first bite and then you get over that silly idea. Today when I was making my linzer cookies I took a bite of one and moaned and hurriedly started the kettle to warm water for a cup of hot tea. It seemed like the perfect companion to my double decker powdered sugar sprinkled valentine. Unfortunately by the time the water was hot, my cookie was 1/2 eaten and by the time the tea had steeped I only had one bite left. Next time I will plan accordingly. 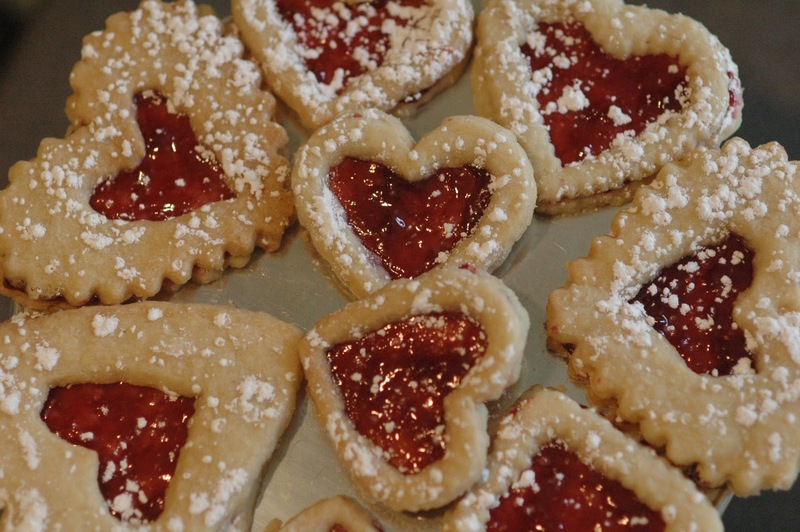 Since I already posted about the Timeless Sugar Cookies in October, I thought I would write about Linzer Cookies. Mine are the American version. 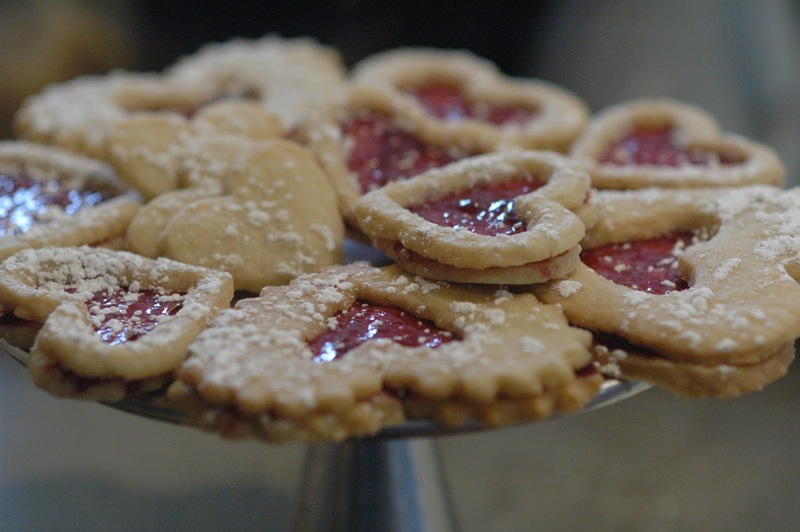 Linzer tortes originated in Linzer, Austria in the 1600’s (or so I hear). The original black currant spread is replaced with Raspberry jam and I also omitted the ground nuts. Basically they are shortbread cookies with jam sandwiched beautifully inside. My mom introduced me to these when I was a teenager- knowing I would love them since I love buttery, sugar cookies and raspberry anything. Right she was! But I must warn you- These are not an everyday cookie. They are a wow cookie, an I-adore-you-so-much-I-am-going-to-give-you-two-cut-out-cookies-with-jam-slathered-in-between kind of cookie. 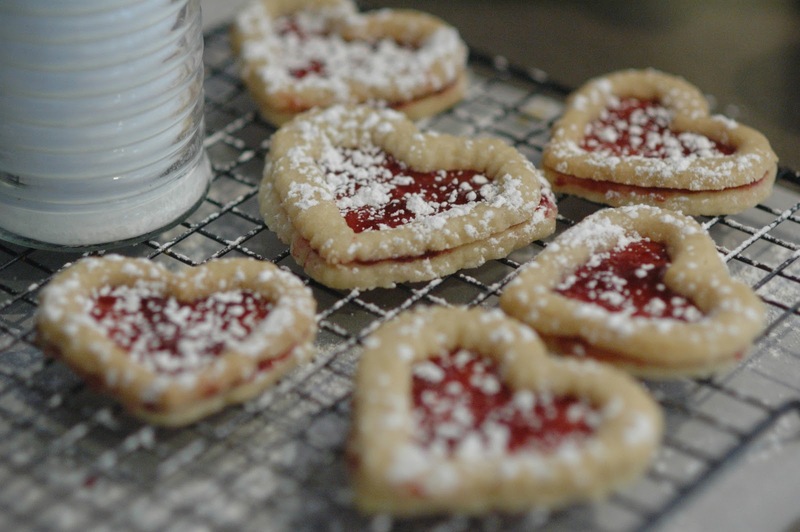 I recently realized that the Linzer cookie recipe uses the same dough as the Jam Thumbprint Cookies from The Barefoot Contessa. I made the Jam Thumbprints during Christmas this year and my son was a little overcome by them. He doesn’t like coconut (allegedly) and yet he couldn’t keep his hand out of the cake plate where they sat. 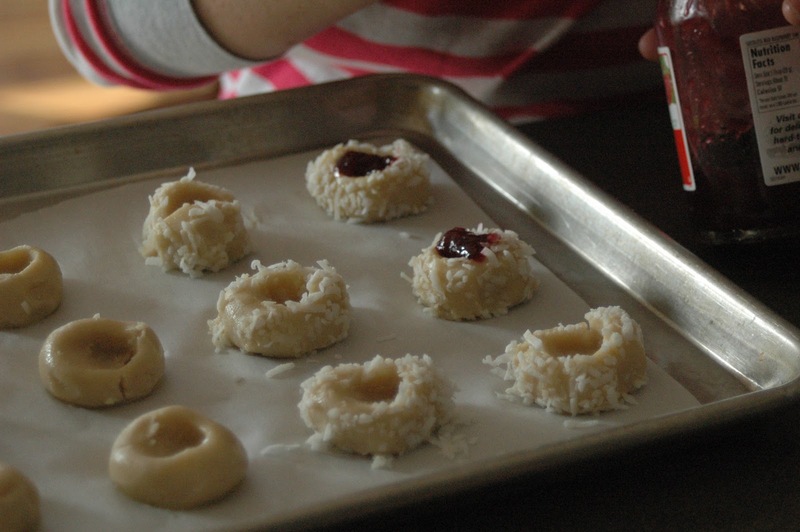 They are the same cookie dough but rather than rolled, cut out and filled with jam after baking, they are rolled into 1 ounce balls, dipped in an egg wash, rolled in coconut, thumb printed, and filled with jam before baking. They are delightful. So I have included them here. Take your pick. Or make them both. Choose your own adventure! Just have fun and share the buttery love! Preheat oven to 350 degrees. Cream together the butter and sugar in mixer until they are just combined and then add vanilla. Separately, sift together the flour and salt. 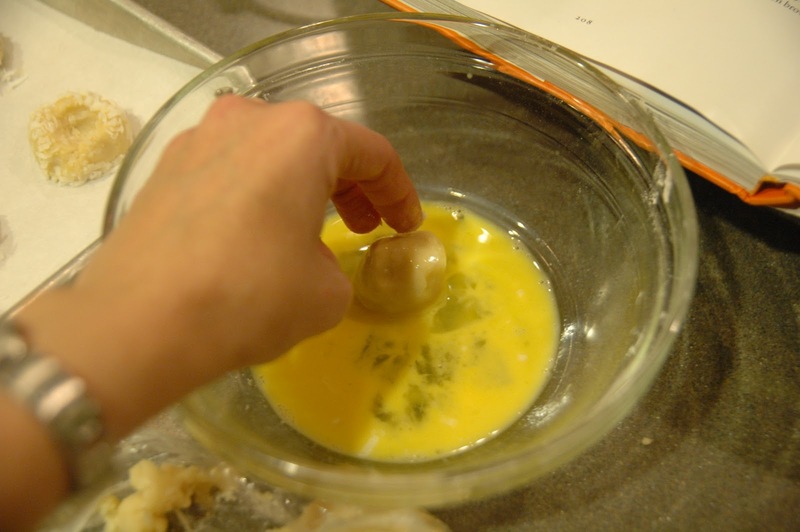 Add to butter mixture. Mix until dough comes together. Dump on floured board- Roll into flat disc wrap in plastic wrap and chill for 30 minutes. Roll dough onto floured surface until 1/4 inch thick. Cut dough into shape. 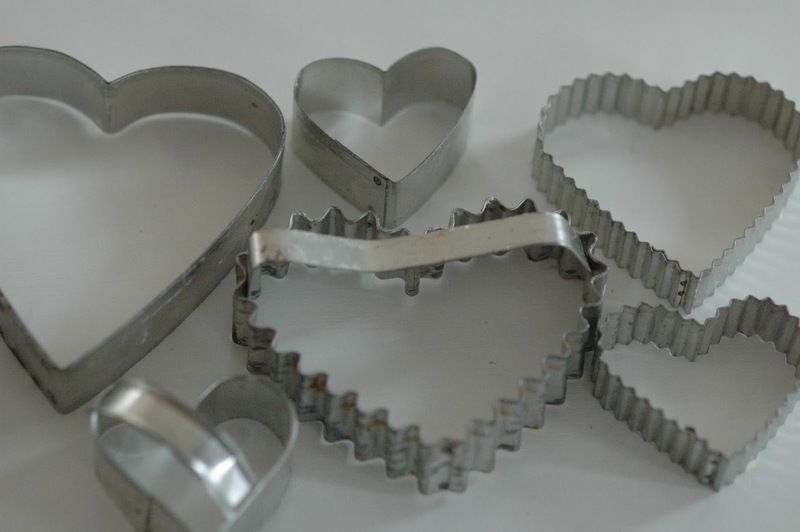 Use smaller cookie cutter to cut out a window in 1/2 of the cookies (so that there are 2 corresponding cookies). Place on parchment lined cookie sheet. Bake at 350 degrees until the cookies begin to turn golden- 10 minutes or so. 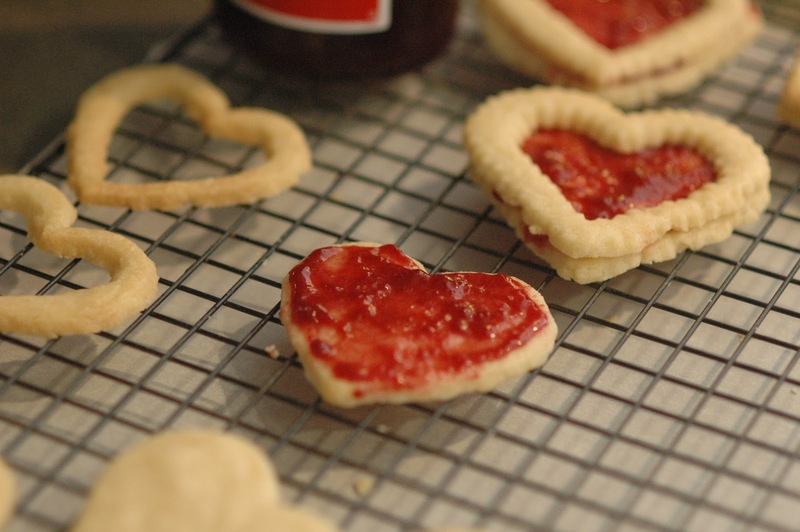 Let cool and spread jam evenly over the solid cookie. Place the frame cookie on the solid cookie and sprinkle with powdered sugar. (The powdered sugar will melt into the jam so don’t be concerned if it gets on the jam). 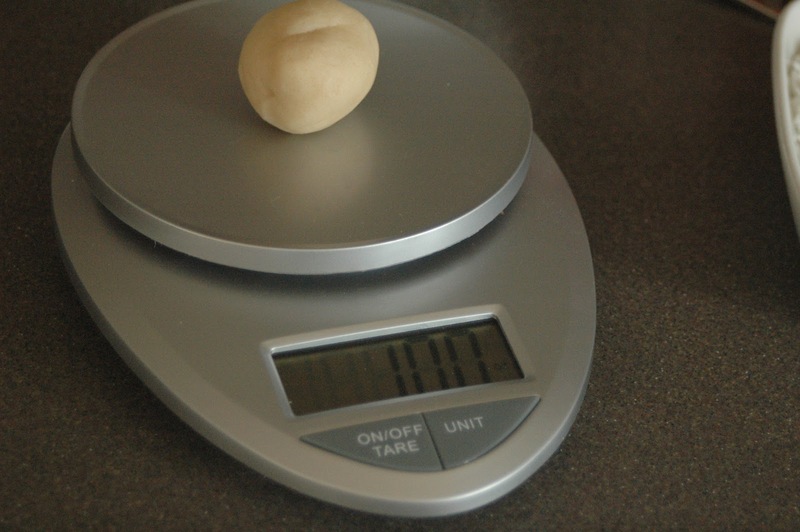 Roll dough into 1 ounce balls (or walnut sized). 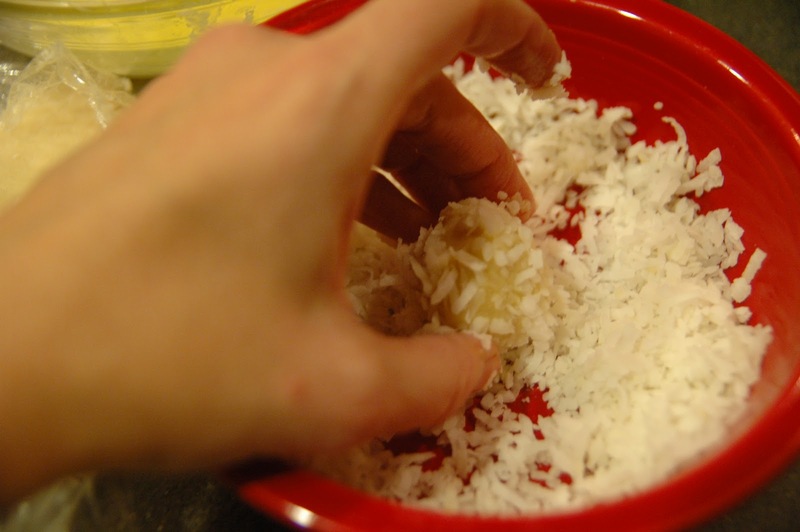 Dip each into egg wash and roll in coconut. 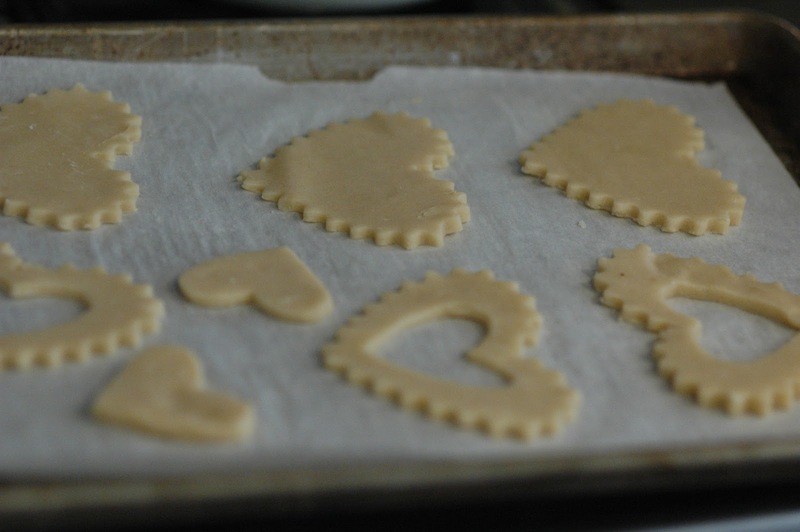 Place on parchment lined cookie sheet and press lightly with thumb. Drop 1/4 tsp. jam into each indentation. Bake 20 minutes or until the coconut is golden brown. I love seeing your scale!!! I'm glad it came in handy – especially since Rich and I got to share in the linzer cookies last night. YUM. YUM. YUMMY! 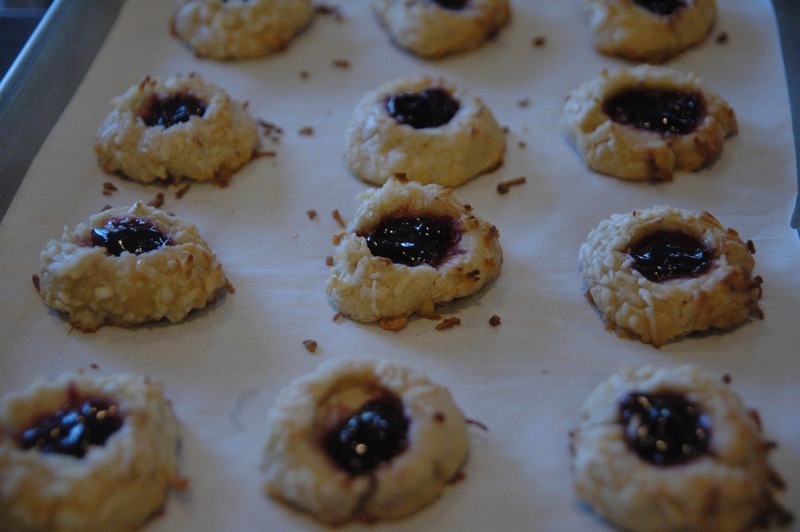 I have to say, and Rich agrees, that the linzer cookies and the coconut jam thumbprint cookies are two of my absolute favorite cookies in the world. In fact, I was thinking last night that I would choose them over ice cream, which is saying a whole, whole lot!!! I'm saving up to buy all the butter I need for the many batches I'd like to make! YUM!!!! Can't wait! Can you freeze this dough (instead of chilling it) to save some for later? Why someone would want to do that, I do not know. Yes, absolutely. It freezes well, just make sure it has time to soften a bit when you take it out so that it doesn't break up.